The Tri rugby session is at Hawick on January 18. The Borders Clan will be training in Hawick today (Friday) to promote Tri Rugby – a unified version of the sport for children and adults with additional needs. There are two sessions – Under 18s at 4pm and Over 18s at 5pm. The principle is based on an approach to the game in which players with conditions such as learning difficulties, autism, or mild physical disabilities, line up alongside able-bodied players for a contact version of the game. The aims include focusing on the social aspect of the sport, bringing people together and making rugby more accessible to more people. “Most people think rugby is about people running about, bashing into each other over a ball,” said one of the organisers, Gary Murdie, recently returned as coach of Hawick Harlequins. “However, The Clan takes a different view,” he added. “Rugby is a team game, that, by engaging in key values, creates an exhilarating and fulfilling activity and thus provides an outlet for individuals who wouldn’t normally be engaged in sport. “The aim is proactively to tackle any limiting assumption that would prevent individuals, communities and cultures coming together to just try rugby. “Unified rugby is a vehicle for enhancing the lives of participants, fostering confidence and social skills and splintering any barriers that still persist around illnesses that are not always visually apparent. “Above all, the main aim is having fun,” added Gary. 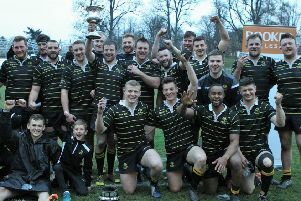 There are varous ‘clans’ around Scotland, and the southern-based enthusiasts have enjoyed some training sessions in recent months, while the Borders Clan had a game against Hawick Harlequins. There is also a national team.